C5S12CD2 Not many artists release 2 separate albums on the same day, as not many artists have the power to go to their record company and demand that this happens. I can remember Guns and Roses doing it with Use Your Illusion I & II and Springsteen did it with this album (Human Touch) and Lucky Town. In retrospect both pairings had a good album in them but not necessarily 2 good albums! My first listen to this album had me really struggling for anything positive to say, the production seems very dated, it has that early Nineties style, the snare drum is far too high in the mix, the keyboards very light and all in all it sounds very like the style used so well be the likes of Robert Palmer and say Huey Lewis. The band although good musicians (step up Randy Jackson now famous as an American Idol Judge) are no E Street Band, there are times on this album when you expect Clarence Clemons to hit us with a huge saxophone solo and it doesn’t appear. So all in all I was ready to give this album a bit of a hammering, but as I mentioned at the very beginning of this project I listen to the albums being reviewed at least twice and on my second listen I started to enjoy it more. Strip away all that I have said and really some of the songs on this album are true Springsteen classics, Human Touch, 57 Channels (And Nothing On), Roll of the Dice, and Man’s Job could sit on better Springsteen albums. At 14 tracks and a hour in length this album is also a little too long. 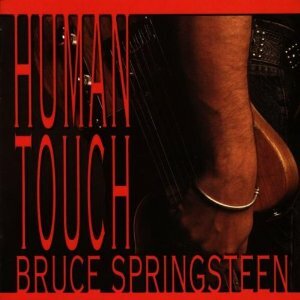 In 1995 Bruce Springsteen released his first Greatest Hits package 18 tracks and only one from this album Human Touch, I think that tells us everything we need to know about how he felt about Human Touch. A Springsteen album more for the Springsteen completist rather than the casual listen, if you new to ‘The Boss’ then there are better albums to start with. If I could give this album a back handed compliment I would say it’s not as bad as I first thought, but not as good as it could have been!